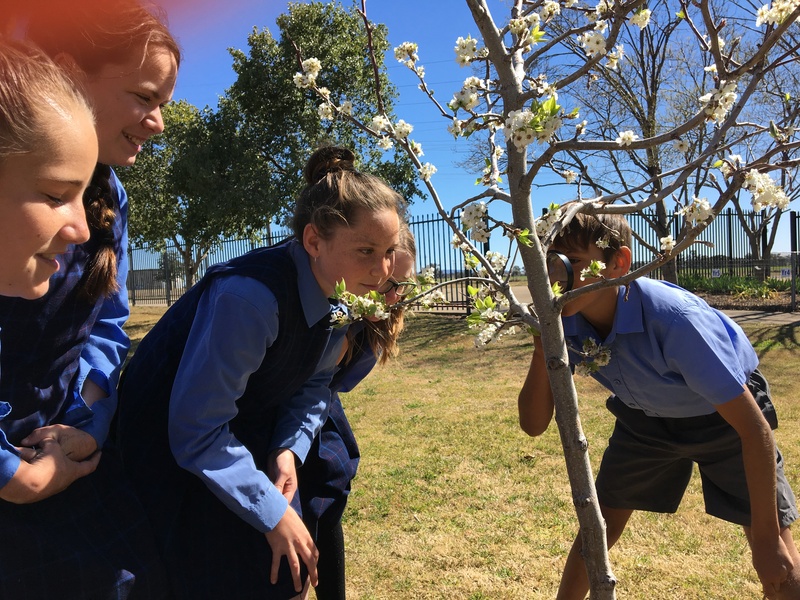 As part of our Discovery Voyager PURPOSE OF POLLINATORS activities we make forays in school grounds with students to see what pollinating insects we can find. Recently we observed the pollination of spring flowers in Tamworth – it was a warm day and lots of insects were busy buzzing around the ornamental plants in the grounds. First we investigated the wattle (Acacia sp., possibly Cootamundra) which was profuse with branches of blossom. This wattle variety has a ball shaped inflorescence – which in reality comprises many individual flowers to make each ball (some species have up to over 100 flowers in the one inflorescence!). 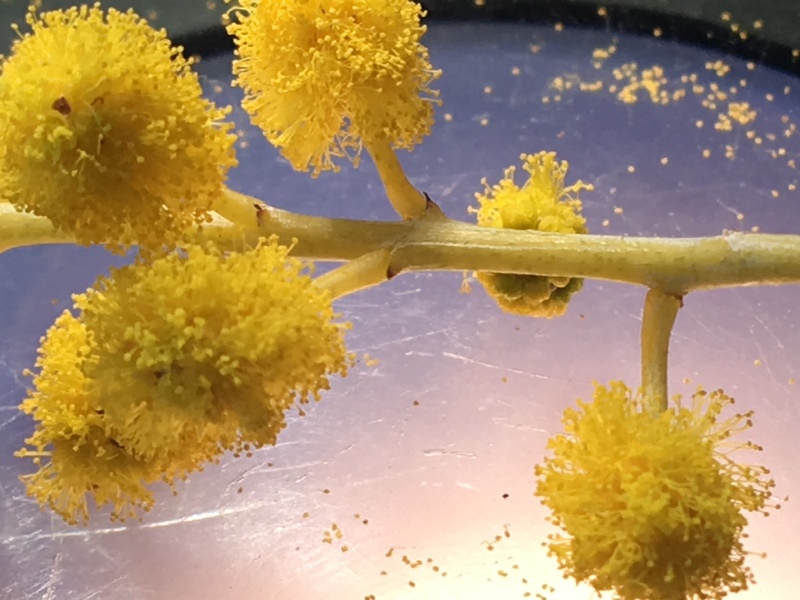 The golden stamens of all these flowers are so tightly packed that it makes the inflorescence look like a fluffy ball (see a close-up of our specimen under the microscope). When we shook the wattle flowers onto our hands we saw many minute beetles which must have been feeding on the pollen and thousands of pollen grains wafting in the air. We also saw honey bees and native bees attracted to the heavily laden branches. Most wattles are opportunistic pollinators and unlike many other plants, do not rely on a specific type of insect or bird for pollination. 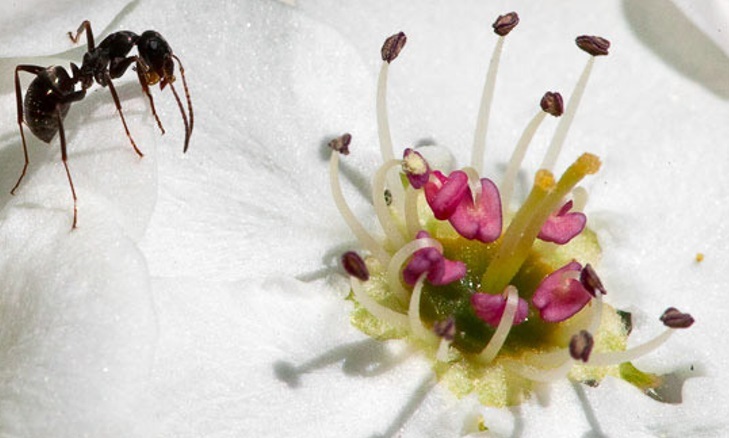 We noticed that the many types of insects which were landing and feeding on the blossom become covered with pollen as they moved from one plant to the next. 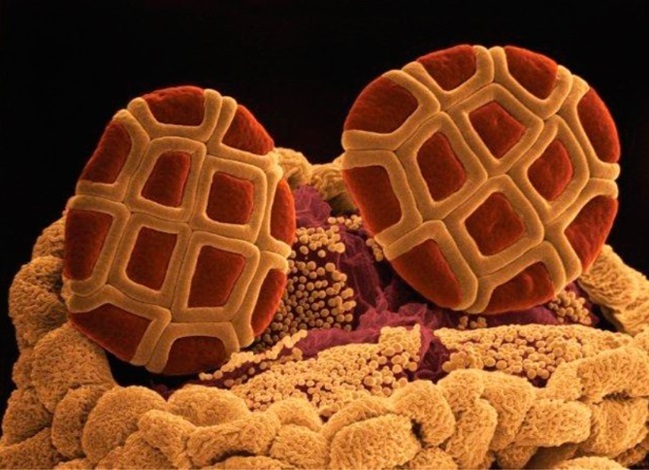 When we have looked at a photo of wattle stamens and pollen grains magnified by Scanning Electron Microscope, students think that the pollen grains resemble a waffle. 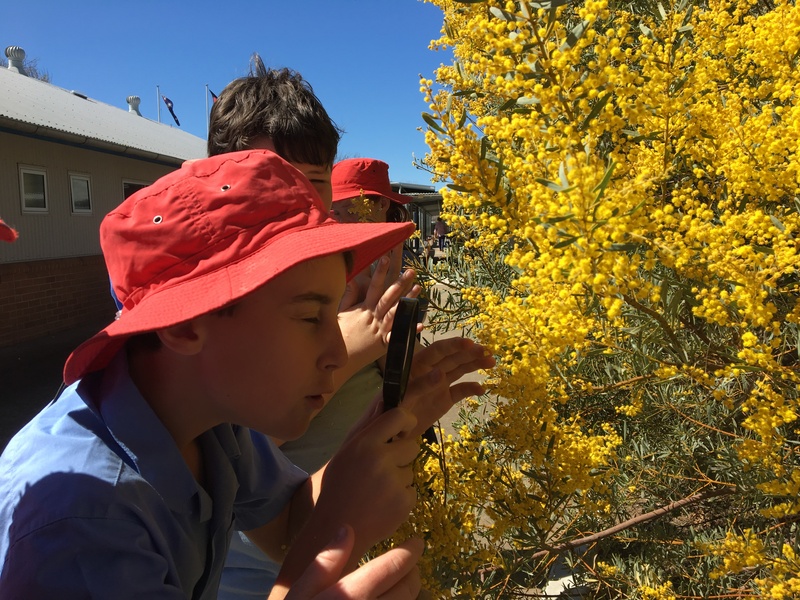 Both students and teachers wonder if all those pollen grains would cause hay fever but wattle pollen rarely causes a significant allergic reaction – the grains are much larger than grass pollen grains and tend to fall straight to the ground. The density of wattle pollen in the air is usually low compared to grasses – eg 3-17 grains compared to 200 grains per cubic metre – see the link below. 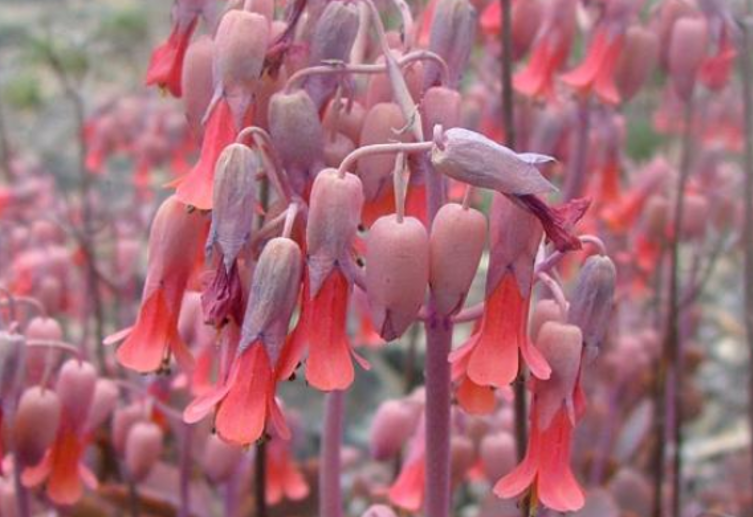 We also looked closely at the nectar globules, formed when the orange tube-like flowers of the succulent plant Bryophyllium sp., known commonly as Friendly Neighbour, was squeezed at the base. 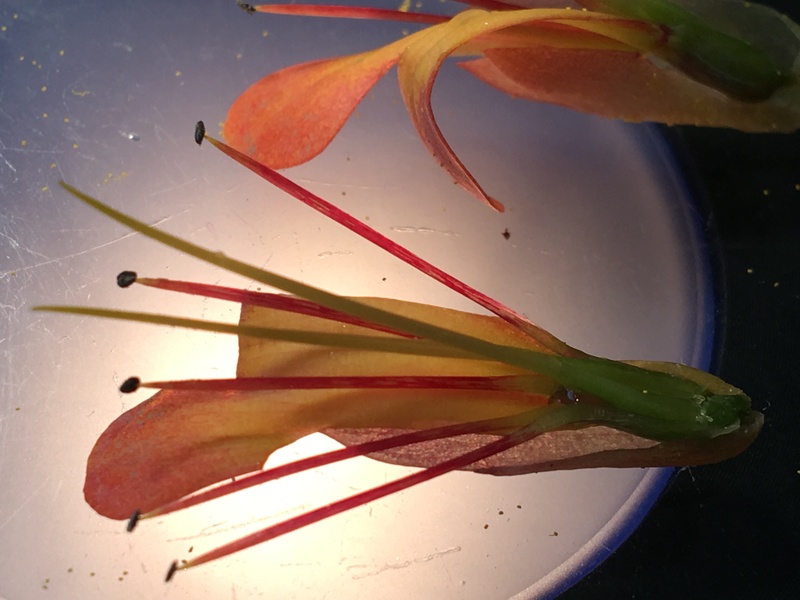 We wondered if a specific pollinator was able to access this nectar and noticed over the day that nectar was only able to be extracted after midday – perhaps the release of nectar was temperature dependent. The students loved finding this hidden source of nectar which they had walked past unawares every day. Similarly, the ornamental pear tree (Pyrus sp.) was laden with flowers that were attracting ants to the nectar, but these pretty white spring blossoms did not smell at all pleasant to us! This activity is another example of where students, when encouraged to investigate the biology of everyday ecosystems, will delight in uncovering the amazing wonders of nature in their own surroundings and make the most astute observations about their discoveries. The mysteries of plant and insect activity will no doubt be a source of keen interest for many students for some time!